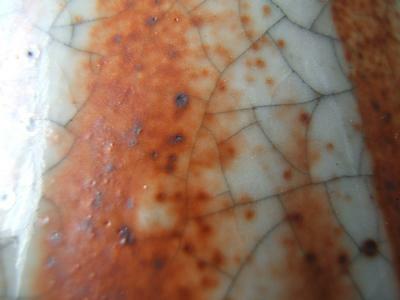 I always seem to be drawn to the unusual kinds of porcelain & nearly always prove difficult to identify. Could you possibly tell me if you feel that this vase is a modern innovative design...or perhaps something older. The vase has even concentric hand made rings, a crackled pale grey glaze over which a brownish oxide glaze is evident all over,both inside & outside the vase. the base is slightly concave with no cut or stepped foot as such. also the unglazed porcelain base appears to be the natural colour as shown. Vase also exhibits a lot of independant random iron spots..some quite large, coming through to the surface. The grey crackled porcelain glaze reveals bubbles evident with a 10 x loupe, they are very small bubbles with random solitary larger bubbles present in the mix. your thoughts on this one would be most appreciated. 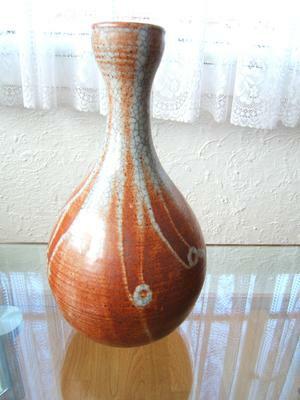 Comments for ANOTHER GE -TYPE VASE ??? First to the iron oxide spots. To me it looks as if they are in the glaze/color on top of the crackle glaze. 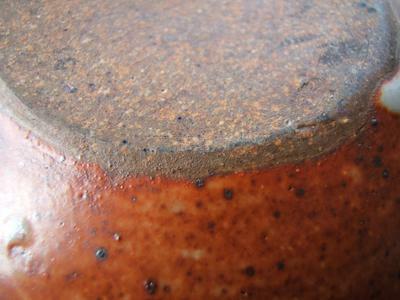 This effect can easily be obtained by adding iron (oxide) to the glaze, as far as I know. The red color is on top of the crackled glaze, it seems... which means that it was fired at a lower temperature after the crackled glaze. 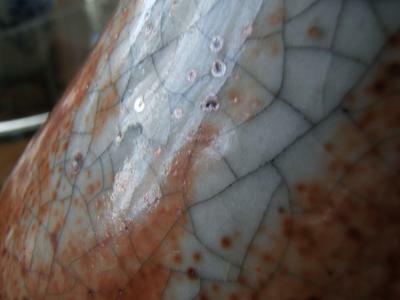 What concerns the crackles, crackles do develop on many items during firing, but they are often so small that they are invisible. The type shown here could be artificially created. They develop due to the different cooling rates of clay and glaze in the kiln. With an electric kiln it should be much easier to control cooling speed, in order to obtain the desired crackling.